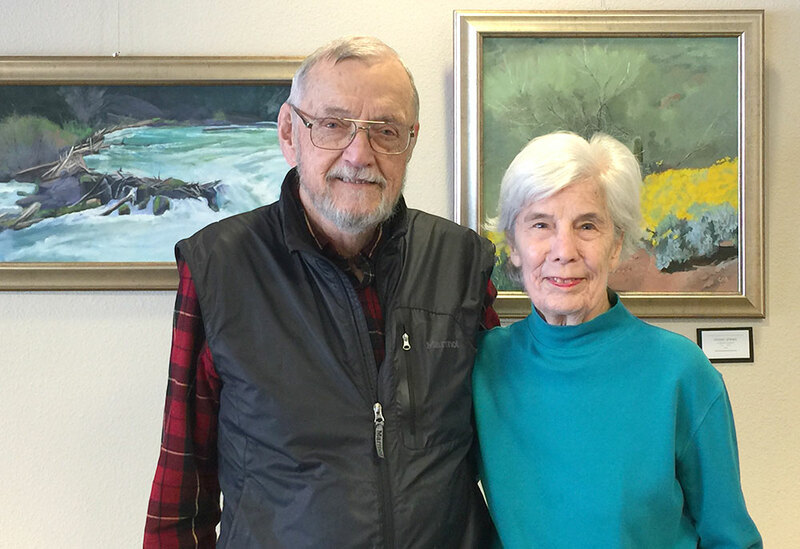 Husband-and-wife painters Gordon and Kay Baker are the featured artists at Sisters Library this month. Both artists paint primarily landscapes, but their approach to art is wildly different. Kay and Gordon moved to Bend in 1995 after Gordon's retirement from a major oil company. For many years, they were active in the local arts scene, as members of Plein Air Painters of Oregon and Oil Painters of America. They showed their work at Sisters Gallery and Frame Shop from 2014 until 2017, when they sold their home in Bend, and moved to Prescott, Arizona. Last year, a visit to friends and family prompted a decision to move back home, where the arts community suits their souls. They re-joined the Sisters Arts Association, and are back showing their work at Sisters Gallery and Frame. "Ever since I can remember, I have loved to draw and paint," Kay says. Her life's work has been about the study of art. She has a Bachelor of Arts degree, and continues to refine her techniques via workshops with well-known artists. She works in oil and pastel and is primarily a plein air landscape painter. "I want the viewer of my paintings to sense the emotions I experience when I am painting," she said. One of her favorite teachers, Jean LeGassick, urged her to write down what she wanted to express in her painting before she started. "This helps me to focus on my idea as I am painting, and not get sidetracked on non-essential details." Her impressionistic style exaggerates light and color "sometimes leaving out some of what I see in order to establish a pleasing composition." 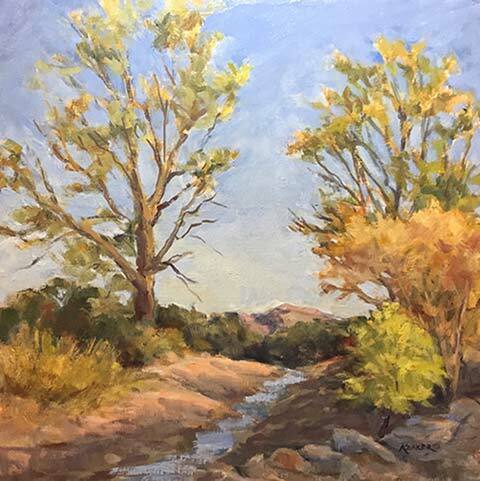 She doesn't limit her work to paintings of the mountains and high desert. She loves to travel and paint what she sees, from lavender fields to mountains and meadows. The paintings in the Computer Room of the library depict scenes from both Arizona and Oregon. Years ago, artist Bill Herring challenged her "to look into the horses of her soul," that is, to see what really motivates her and what she wants to convey through her work. "Those horses are joy, freedom, faithfulness, and glory." "There is something about being outdoors that brings joy to my spirit," she says. "I connect with the scenery, the fresh air, and the light." Before starting each painting, she considers light, shadow, colors, and reflections on a subject. But, as the light changes quickly, she often makes small paintings, to be used as a guide for larger works. She often sells the small unframed paintings at a low price point that enables nearly everyone to own a piece of original art. Her work can be seen in the library's Computer Room. Gordon is a geologist, environmentalist and artist. Nature is his common denominator and painting brings it all together. "My oil paintings reflect who I am; a summation of a lifetime of experiences." He grew up in Sioux City, Iowa in the last half of the Great Depression, where the riparian environment of the Missouri River bonded him to nature. He worked his way through the University of South Dakota, and has a master's degree in geology from the University of Wyoming. He didn't get serious about art until after his retirement. Gordon worked for Mobil Oil for 31 years, 16 of them internationally. He dealt with petroleum ministers and staff, conducting field studies in wilderness areas. He experienced two Arab-Israeli wars and was in Saigon when it was under assault. Later, he was in charge of a research vessel in the South Pacific, was a manager of oil field development, and managed a research group. "This is where I learned the significant difference between innovation and creativity," he says. He now applies to his artwork the principles of the research process that solved problems in the oil industry. "I am not the typical artist," he says. "I have no formal training in a university or art school. I had a few workshops early on, but I got nothing out of them other than the opportunity to meet people. If I can, I prefer to find a workshop that is less on painting, and more on how to see your subject through the lens of your inner self, and paint it in your mind first, before touching the canvas - in other words, the psychology of seeing something different from the way others see the same thing." His work, including scenes of magnificent mountains, raging rivers, and curious wildlife, is the sum of his life's experiences. His work is featured in the Community Room of the Library. The Art Committee of the Friends of Sisters Library (FOSL) arranges ongoing exhibits throughout the year. Most of the work is for sale, and forms to purchase art are available at the library. Artists donate a portion of the sale price to FOSL. Next month's exhibit will be by the Sisters Area Photography Club. The library is open Tuesdays through Fridays from 10 a.m. to 6 p.m., and Saturdays, from 10 a.m. to 5 p.m.